Arlene L. Walker is passionate about the written word. Her friends tell her even her Emails are writ full of drama. For years, she worked as a stenographer writing other people's words until one day she was forced from the workplace. She decided to pursue her lifelong dream of becoming a writer. 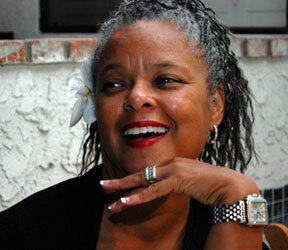 She enrolled in the UCLA Writers Program to pursue a Certificate in Fiction. She began to enter first one short story contest, then another, and another. She was thrilled to finally garner an Honorable Mention in a publication last year, but being in the top ten of the WOW! Women On Writing Fall 2009 Flash Fiction Contest is her highest achievement to date. When she's not spending time with her family, Arlene is either reading, writing, or working on her blog about her Bucket List escapades, Adventuresalon.blogspot.com. Her favorite quote is by Ayn Rand who said, "It isn't who is going to let me; it's who is going to stop me." Next stop for Arlene is penning the Great American Novel. If you haven’t read her winning entry, you can do so here, and then c’mon back for our interview with Arlene. WOW: So glad you could join us today, Arlene, and congratulations! How does it feel to be one of the top finishers in WOW! Flash Fiction Contest? Arlene: It feels like I'm eating a bucket of chocolate chip cookie dough ice cream, and not getting fat. It's a dream come true. WOW: (laughs) Fabulous, that has to be one of the best responses yet! We’re glad you feel that way! If you would, can you tell us a bit about yourself? Arlene: I was born and raised in the housing projects of Los Angeles, though I now live in the suburbs. I'm married with children -- actually, they're adults now and living on their own. I am happy to say not once did I ever experience empty nest syndrome. I presently attend the UCLA Writers Program, and I'm just thrilled to be there. It's where my imagination soars. WOW: Isn’t it great how writing does that? Let’s talk about your entry. In your story, you took a unique approach regarding your character’s experience with abortion, not a topic that’s easily approachable. Can you share how you decided to take this direction in creating your story? Arlene: I wanted to expose the brutality of illegal abortions, and how a 15-year old pregnant virgin might deal with it. During a procedure in which she is almost fully awake, her only avenue of escape is via the movie reel of her life she plays in her head. WOW: As I read, I could easily see your story being turned into a short film. Your story packed a heck of a wallop, elliciting a range of emotions from me. Not an easy read, but worth the effort to do so. Good work! Arlene, your bio mentions that you went from being a stenographer to actively pursuing your writing dream, including enrolling in the UCLA Writers Program to pursue a Certificate in Fiction. Quite a switch in gears! Can you share that experience with us? Arlene: I worked for many years in a high-volume criminal court where day in and day out, I wrote down verbatim everything that was said during the trial. As such, you're not an active participant, but a silent observer. Well, that left my mind to wander, and I'd make up backstories in my head about the various witnesses, attorneys, and the criminals they defend. That spawned a desire to use my creative side. When I was diagnosed with Carpal Tunnel Syndrome a few years ago, I was no longer able to perform my duties, and was forced by my employer into an early retirement. I took those lemons and made lemonade, where I serve it up by the pitcher full at the UCLA Writers Program. WOW: Seeing an opportunity to pursue your dreams and going for it. What a great example of the perseverance we writers need to develop. Let’s talk about your writing habits. Do you have a specific routine that you follow? Arlene: Having Carpal Tunnel Syndrome, I am limited in the time spent on the computer, so -- again -- I do most of the formulation of a story in my head. Then I write it down little by little. Flash Fiction seems to work best for me. WOW: I’d have to agree on that. It does take practice to write short and tight for flash fiction, and your story was very successful in achieving that. Now, in addition to writing fiction, you’re also a blogger. I have to say that Adventure Salon, your blog of ‘bucket list’ activities, was a delight to read. What made you decide to blog about your adventures in travel? Arlene: I'm delighted that you were delighted by my blog! I think everyone has a list of things they'd like to do in their wildest dreams. I'd always had a list; I just didn't know it was called a Bucket List until the movie was made. So when the writer within was fighting to get out, that was the only way I knew to channel it. Blogs are a good place to practice your writing, and the blog site is free. And if it's free. . . it's me. WOW: With the availability of free blog sites, it's easy to get started. And I agree that blogging's a great way to expand writing skills. Let's talk about down time. When it comes to winding down, what types of books do you turn to? Do you prefer fiction or nonfiction in either your reading or writing? Arlene: The only nonfiction I read may be a biography here and there, or books about writing. I'd already read Noah Lukeman's First Five Pages, so I was honored that he was the judge who selected my story for 2nd place. I guess my genre of choice to read is literary fiction. Though I love me some John Grisham, too. Of course, I want to be a literary writer, and I hope I am considered that. WOW: I think you’re off to a pretty good start with that. How about current writing projects? What are you working on? Arlene: I'm currently working on a post-Civil War saga about a former slave of the Cherokee Tribe who is caught in the middle of a tug-of-war between the Indians and a land-hungry United States. The heroine is called Sput Louie, and she hungers for her own piece of The American Dream. There's a lot of research to it, but research is one of my favorite parts of writing. That and revision. I know; I'm officially weird. WOW: That sounds fascinating! I’m with you on researching, I enjoy it too. Have to pass on the revision aspect of writing, though. But, it’s all good that it jazzes you! Wrapping up, what kind of advice would you like to leave for our readers? Arlene: My father always said to me, "Know thyself first." In other words, I think he meant pay attention to you, which I didn't for a long time. One day, while cleaning out my bookcases, I discovered a gazillion how-to-write books that I'd purchased throughout the decades. Had I been paying more attention to me, I would have realized how badly I wanted this writing life, and would have embarked on this journey much sooner. As it is, I'm in Act III of my life, but I plan on having many, many encores. WOW: Your father sounds like a wise man. Good thing for us that you paid attention! Arlene, thanks so much for sharing a bit of yourself with us today. All the best in your writing, and we’ll be looking forward to those encores!